Profile: "OneUTSystem" has its own website to keep staff, students and the public up-to-date on the latest developments. The new high-efficiency facility will consolidate operations from five (40 to 130-year-old) buildings and provide high-tech space for about 550 employees. Relocating departments include Business Affairs, General Counsel, Board of Regents, Campus Police and an EOC with Command and Control Area. 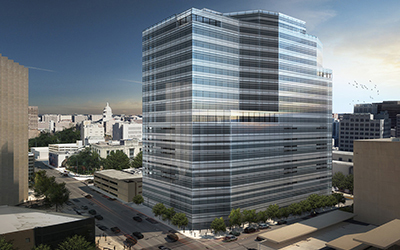 The 20-story building by Page-the top floor is a mechanical penthouse-will feature a conference center, fitness center, café and "ideal configuration" offices for UT personnel; eight levels of parking; and two floors of leasable retail space.